Please select length and design type. We have two different design types. The first type has 3M tape on the back with no silicone sleeve. The second type is encased in a soft, clear, flexable silicone sleeve with no 3M tape. The silicone sleeve is great for outdoor use or for protecting the lights. If used outdoors, connection plugs, wifi SkyPuck and wires will still need to be weather proofed. Each system will come with the number of rolls that you select, wifi SkyPuck and enough power supplies/converters which allows you to plug directly into a standard 110V (volt) wall outlet. We will also send you all the connectors and or wires that you need to do a standard hookup of each system. The included SkyPuck is compatible with Android or iPhone. After downloading the free app you can customize any pattern, pause any pattern, control brightness and much more. Cuttable every 4 inches. However, it is better NOT to cut these at all and just let the controller know what length of lights to turn on. 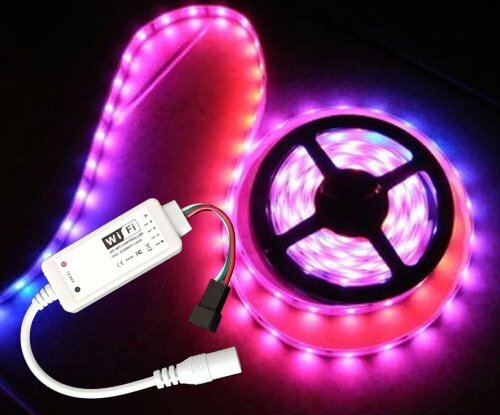 If you select CRAZY LIGHTS that are encased in a soft, flexible silicone sleeve and want to use them outdoors, you must waterproof any connection or any place where wires are going into the crazylights. You can do this by using clear silicone sealant. The only extra item you may or may not need and is not included with this order is the 40" female to male lead. This lead is only used to put spacing in between rolls of lights if that is needed based on your design. This is not needed to make the lights work and should only be ordered based on your design needs. * Power: 7.2 watts or 0.6 amps per meter or 3.3 feet. The number of power supplies that are needed to opperate the number of rolls of lights that are ordered. A 3 amp power supply will be sent if only one roll is ordered. 6 Amp power supplies will be sent with all other orders. * Home and Car DIY lighting.